Eyeshadow's are my weakness, I just absolutely adore them and cannot get enough of them. So far I have every eyeshadow palette Kylie has released (reviews coming soon!) 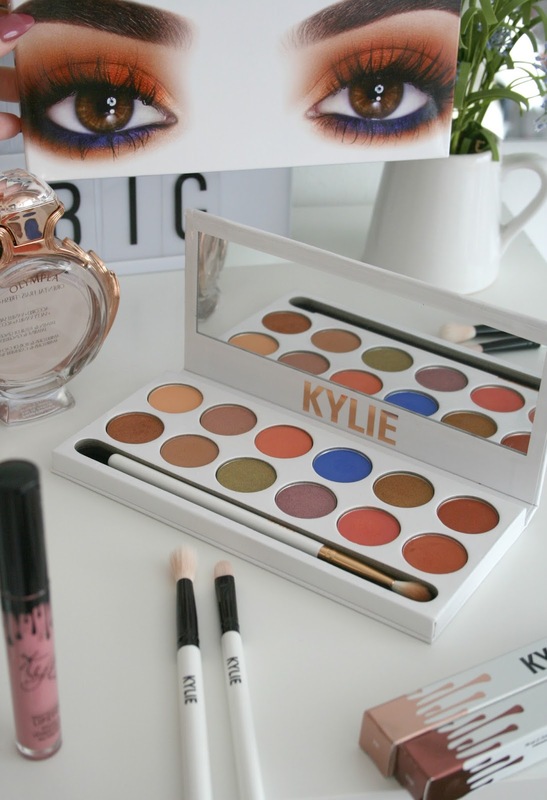 However today I thought I'd start out with the latest eyeshadow release from Kylie, I mean just look at that palette! Firstly I want to talk about the sleeve of the palette, featuring her eyes. How absolutely stunning is the eye makeup!? I've been trying my best to pull it off but I guess I just have to keep practising because it never looks that good to my dismay. Featuring 12 shadows, unlike her other ones which only feature 9. This palette is absolutely huge and I love it. For an idea of how big it is it's slightly wider and longer than the Urban Decay Naked palettes. It also includes a really good sized mirror which some of her first launched ones don't have and finally included in this one a brush! Kylie did release an eye brush set back at Christmas (which you already know I jumped on that bandwagon and got them) and I absolutely love them. They're so soft and blend out your products so seamlessly. The brush included in the palette is great for applying shadows to your crease as it's the perfect size and blends the product out perfectly as you apply it. This palette retails for $45, just $3 extra for another 3 shadows! Finally onto the shadows themselves. This is honestly one of the prettiest palettes I own. I just love the range of shades and how well they all go together. While there are some shades that I will probably never use...I'm looking at you Mojito I just cant not get all heart eyed when I see the palette! Did I mention eyeshadow palettes were my weakness!? The shadows themselves are quite pigmented although I will say when you do swirl your brush in a shadow you get a lot of fall out, so much so that when I'm finished using the palette I have to sweep any excess powder off it. While it's powdery in the palette I don't find I get an awful lot of fall out when applying them to my eyes. 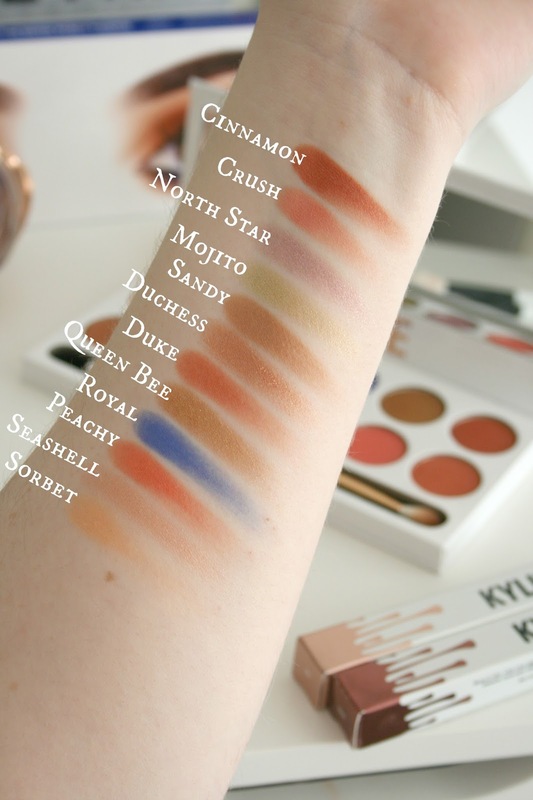 While I adore Kylie Cosmetics I will admit some of these shadows are more pigmented than others, some need a bit of work to get the colour pay off it shows in the pan. Shadows such as Royal, Duchess, and Mojito aren't as pigmented or smooth as the others. I find that if you try and apply these using a brush you've gotta build them up. However I have found that if you use your finger they seem to work a tad better, although using your finger isn't an option most of the time unless the colour is going on your lid. What I love about this palette is I think theres a colour combination for every eye colour to really make it pop. I have been loving using Peachy, Queen Bee, Sandy and Cinnamon to create a smokey eye. I still have yet to master Royal under my lash line without looking a tad silly. But I swear I will get it right eventually! I know there was a bit of a controversy when people started receiving this palette, complaining about the smell of really strong chemicals from the palette. I will admit the first day I received mine there was a weird chemical scent off it but the next day I didn't notice it at all and it has now completely gone. When things like this launch I do think people try their best to look at the negatives rather than the positives, and like this is the internet people just use it to moan all the time. While I know its a split right between the middle and you're either team hate Kylie Cosmetics or team love Kylie Cosmetics (woo go team) this is something I would definitely recommend trying out if you are after these kind of shades. 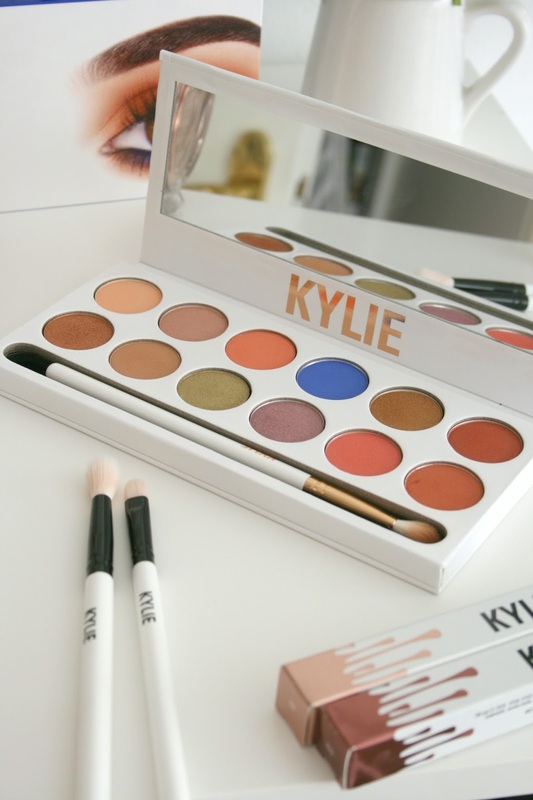 Have you tried any of Kylie's eyeshadow palettes yet? Oh they look really nice and super pigmented! I can't decide if I love her cosmetics or not at the moment haha I had a liquid lipstick and liner and I love it but it was pricey and dried out my lips so it's hard for me! This is such a lovely palette. Great to hear you liked it! I've always been so curious of Kylie's eyeshadows! Exquisite array of shades. Kylie Cosmetics palettes always look so appealing to me.